Earlier in the week, we had been planning to go into New Ulm this morning, buy groceries at the HyVee and say "Hi!" to Congressman Walz while expressing our distress at the treatment of outpatients at Walter Reed. Yesterday, our storm-is-coming prairie instincts kicked in and we secured food, bourbon and a six-pack of Schell's Schmaltz Alt in advance of the weather. Dozens of cars and trucks slid into highway ditches through Friday night and early this morning as sleet and then snow, as well as several bolts of lightning and thunder, clapped down on southeast Minnesota. Law enforcement did not have totals for the number of accidents it investigated or dispatched tow trucks to, but roads seemed most treacherous outside of Rochester, especially along Interstate 90 from Dover west to Austin, as a steady stream of tow trucks pulled and straightened semi-trucks back onto the roadway. Often the trucks blocked traffic in the blinding storm. There have been "a lot of trucks and cars in the ditch everywhere," a State Patrol dispatcher said, before directing troopers to another jackknifed semi on I-90. Since the weather threw some transportation issues at us this weekend, we'll turn to an article about the DM & E from today's Post Bulletin: Legislation to halt DM&E expansion faces long odds. Minnesota lawmakers return to Washington next week hoping to advance legislation to stop the pending $2.3 billion federal loan to the Dakota, Minnesota & Eastern Railroad, yet there are no clear indications that they will get the bill enacted into law. The Federal Railroad Administration, an agency within the Transportation Department, is currently within a 90-day review of the company's financial condition, and is to make its decision on the loan by early May. The loan is key to the privately held company's plans to finance a combined $6 billion extension into Wyoming's Powder River Basin coal fields, along with upgrades to its Midwest rail network. The Mayo Clinic, with the city of Rochester, Olmsted County and the Rochester Area Chamber of Commerce, have long sought to kill the project because of fears of increased downtown train traffic, and the groups have mounted a public campaign against the loan. The new bill would require congressional approval of any Transportation Department loan of $1 billion or more. Rep. Tim Walz, the freshman Democrat from Mankato, on Feb. 16 introduced the House version, and Sens. Norm Coleman, R-Minn., and Amy Klobuchar, D-Minn., introduced a Senate companion. Walz's bill has been sent to the House Transportation and Infrastructure Committee, chaired by Rep. James Oberstar, D-Minn., while the Senate bill has been sent to the Senate Commerce Committee. It must be signed into law before the loan is approved, putting lawmakers on very tight timetable. Walz said he intends to use his seat on the transportation committee to push for quick consideration, but acknowledged he has yet to win Oberstar's support. He also acknowledged that the Senate bill could be killed by a filibuster, if need be, by DM&E-backer Sen. John Thune, R-S.D., who lobbied for the railroad before winning his seat in 2004. 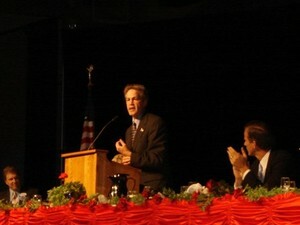 In 2005 Thune pushed through a provision to expand and change the FRA's railroad construction loan program to help DM&E. "Can he kill this thing? He very well could," Walz said. "But I can guarantee you that it will be very, very, scrutinized for him to do such a thing now." While the Post Bulletin focuses in on the House bill, which is co-sponsored by Minnesota representatives Bachmann, Kline and McCallum, we'd like to suggest that Senator Coleman use his friendship with Senator Thune to apply pressure. How close are Thune and Coleman? In 2002, they took their fundraising on the road along with Jim Talent of Missouri. President Bush nicknamed them the "Three Amigos;" Talent and Coleman were elected. Thune lost his bid against Tim Johnson, and had to wait until 2004, when he knocked off Tom Daschle. Candidate Abraham Lincoln, the founder of our Republican Party had come to Omaha to give a speech. That night, he stayed across the river at the famous Pacific Hotel in Council Bluffs , Iowa . The hotel boasted a big front porch with a commanding view West. Omaha at that time was the terminus of the Eastern railroads. What Lincoln did as soon as he got to Omaha was collect the best railroad men in the area and invite them to meet on porch. As a state legislator years before, Lincoln had proposed an Illinois State railroad before he had ever seen a train. Abraham Lincoln gathered that little group of experts on the porch and asked the Big Question: What’s the best route for a railroad to the Pacific Ocean ? Nine years later, Lincoln was dead, but they drove the golden spike that completed the world first transcontinental railroad that united America literally, “from sea to shining sea.” The route was chosen that night and a dream was born. My purpose tonight is to invite you onto a virtual porch of our own and ask you to think with me: What’s the best route to American future we all cherish? What path should the next journey of American freedom take? Perhaps Senator Coleman can invite his close friend John Thune to sit on the porch (virtual or otherwise), then ask the DM & E's former lobbyist those two questions, narrowed down to the concerns surrounding the DM & E railroad. "These are things that gets PR (public relations) firms excited and lawyers excited and media guys excited, but when you get down to the core of it, there's just no traction there on the merits. I have some faith in the merits[.]" Schieffer said approval of the loan, if it comes, will entail numerous conditions, including proof that the railroad will have enough business to repay the loan. He also said the loan approval would not close the door to a mitigation agreement with Mayo and Rochester, although he said he can't say what that agreement might entail because the opponents have yet to prove new risks to federal regulators and in court. "It's not too late for mitigation, ever," he said. Okay then. We'll be posting MN-01 news as we dig it up. At least the storm will allow us to indulge in our favorite winter sport; we hope to break out the snowshoes later in the evening. Maybe even do a little owling.